There will be new changes in Username and Password for vendor. Your Username will be your email address. Your Password remains the same but can be reset by clicking the reset word in blue. Starting from 1st April 2019, all procurement process via Open Tender (OT) and Tender by Invitation (TBI) shall implement a new process of completing the Declaration on Related Party Transaction (RPT). A new version 4 (Apr. 2019) - OT/TBI was created whereby all interested Tenderer/Bidder is required to download and complete the Declaration on RPT prior to purchasing of the Tender/Quotation/RFP document. The Tenderer/Bidder shall not be allowed to purchase the Tender/Quotation/RFP document in the event the Declaration is incomplete or fail to present. The said Declaration together with samples and definition of RPT can be accessed via this website.The new process is also being notified to all Tenderers/Bidders via MAHB Tender Notice/Invitation letter. The rapid evolution of internet into an ultra fast, powerful and borderless communication tool has transformed the course in which businesses are conducted in this era. Present business model is characterized based on speed in its response, global in its outreach and timeless in its environment. 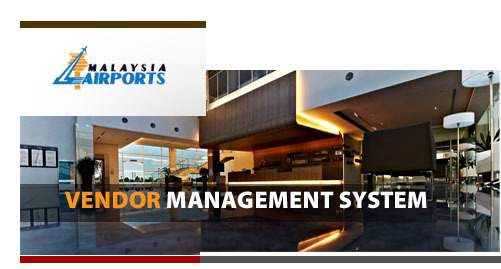 And now, the VMS - Vendor Management System, is another strategic and affirmative move by Malaysia Airports to tap and utilize the power of internet. It is a system designed to shift vendor registration processes from manual, snail-pace exercise to an online environment where registration can be done at vendors’ desktops, in their own comfort time from wherever they are in whole wide world. Online registration reduces processing time very significantly, minimizes human interfacing and errors, stores and archives registration data automatically in central server and a whole lot of other inherent benefits. Malaysia Airports is serious to eradicate corruption practices among employees at all levels in the course of their duties. To achieve this, Procurement code of ethics were established and incorporated into Procurement Policies, Procedures and Guidelines. We wish to highlight the ethics as reminder to our valued vendors to achieve the objectives whilst adopting best practices in procurement. The information contained herewith is for general information purposes only. The information provided is only tentative and MAHB shall have the right to make changes to the following information at any time. MAHB accept no responsibility for, and give no guarantees, undertakings or warranties concerning, the accuracy, clarity, completeness, timeliness, or otherwise, of the information provided and do not accept any liability whatsoever in respect of, or arising from, any errors or omissions or any reliance on, or use of, such information. The information contained herein is extracted during the opening of tender on the closing day of the respective tender exercise. Thus, the information displayed shall have no bearing in the award of the tender. The information contained herewith is for general information purposes only. MAHB shall have the right to make changes to the following information at any time. MAHB accept no responsibility for, and give no guarantees, undertakings or warranties concerning, the accuracy, clarity, completeness, timeliness, or otherwise, of the information provided and do not accept any liability whatsoever in respect of, or arising from, any errors or omissions or any reliance on, or use of, such information. All information including information in the attachment contained herein are provided as a general information only. The information provided does not indicate a guarantee, undertaking or warranties concerning the appointment of the successful vendor. The final decision for the award is subject to the approval by the respective Procurement Committee. All decisions made by MAHB (or any of its subsidiary companies) are not subject to any appeal from any Government Bodies, or by way of arbitration or any legal proceedings. MAHB (or any of its subsidiary companies) shall not accept any liability whatsoever in respect of or arising from any errors, acts or omissions or any reliance on or use of such information. 1 563430-K ARA TECHBIS SDN. BHD. 2 544336-M ITMAX SYSTEM SDN. BHD. 8 221681-H SMEC (Malaysia) Sdn. Bhd. 9 221681-H SMEC (Malaysia) Sdn. Bhd. 10 221681-H SMEC (Malaysia) Sdn. Bhd. 11 221681-H SMEC (Malaysia) Sdn. Bhd. 13 65322-T Media House Sdn. Bhd.